With Ferrari producing around 400 Enzo supercars, the last thing you would to do is damage it and then make headlines. Unfortunately, that's what happened to car dealership owner, Zahir Rana at the Targa Newfoundland Rally in Canada. 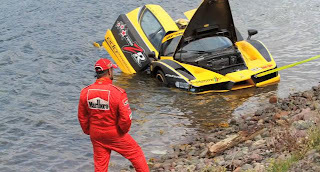 The 2003 Enzo, tuned by Edo Competition, was driven by Rana when he hit a hump, sending the vehicle into the sea. Rana and his co-driver Roland Linder escaped without any injuries, while the car was rescued, sustaining minor damages. “My first thoughts were, ‘Oh my God, I mean I love my car. To me it’s the best thing ever. But then as I realised, I thank God that I am well and fine. And it’s only a car, it’s not a big deal,” said Rana.